Vincent Chase is a huge movie star and when offered the lead in a new film he demands directing duties as well causing many problems for him and his friends. Doug Ellin ties up the journey that was the HBO series, bringing to an end the journey of Vinny and his mates Eric, Turtle and Drama and Vinny’s agent, Ari Gold in Hollywood. 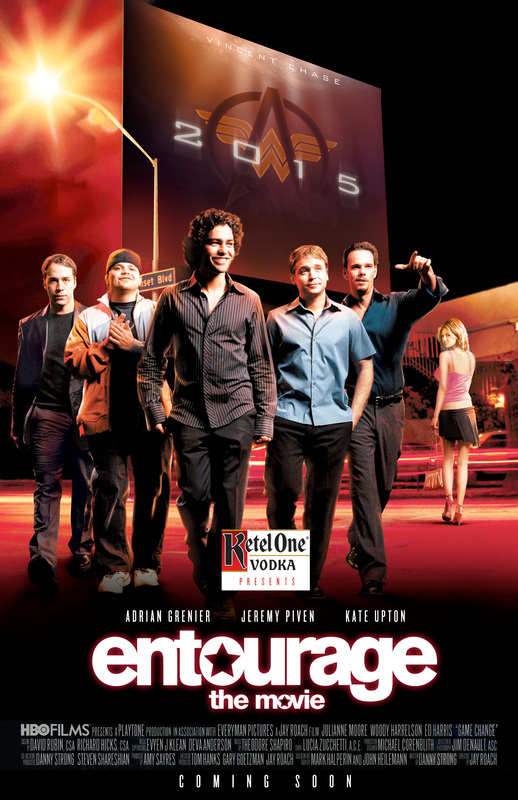 In 2004, Ellin released the first series of Entourage on HBO; an entertaining look at the world of four young friends from Queens, New York chronicling the rising movie star that is Vincent Chase (Adrian Grenier) in Hollywood, Los Angeles and his three childhood friends, Eric (Kevin Connolly), Turtle (Jerry Ferrara) and Johnny ‘Drama’ Chase (Kevin Dillon), Vincent’s actor brother. It was new and refreshing, taking a leaf out of The Larry Sanders Show by having various actors and directors playing ‘themselves’ (really a chance for them to subvert their public persona and have a little or a lottle fun). Over the eight seasons the quality varied, characters didn’t always grow and develop and the stories became a little repetitive at times but it was mostly highly entertaining. The last series was a bit disappointing, fizzling out and tying up loose ends and now there is a film. Warranted? Hmm, not sure. I would rather watch this than a bunch of usual fare from HollyWould; it is basically four episodes of the series made into one story and it is fun and enjoyable, albeit treading the same ground it has already done. It is not the best thing since sliced but it does what it says on the tin. There are cameos aplenty from new and previously seen stars during the eight season run and some of these work better than others. Producer Mark Wahlberg pops up with his own Entourage, the original premise of the show being loosely based on his own experiences as a movie star in LaLa land. New recruits Billy Bob Thornton (excellent as usual) and Haley Joel Osment play father and son money men bankrolling the film that Vinny is starring in and directing and take a lot of delight making trouble for our hero and his merry men. Scott Mescudi (Kid Cudi) plays Ari’s new assistant Allen and is given short shrift with a role that could have been meatier. Regular guests Gary Busey and Bob Saget play severely twisted versions of themselves in some very funny scenes. See it if you are a fan, otherwise wide berth it. Blackfish is a documentary film that shows us the inside world of Orcas; beautiful Killer Whales, in captivity and the endangerment to the trainers and the whales themselves. These Orcas perform dancing bear tricks for you, the complicit, paying audience at Seaworld and many other animal parks around the world. This film has been out for a few years now and caused a big splash when it was released. As terrible as watching the immoral activities of big business exploiting these innocent creatures is, this is a must-see. This film has had a big detrimental effect on the Seaworld shares. It contains interviews from many previous employers of Seaworld telling the truth about how these magnificent creatures are treated in this water-prison/circus. Watching this is not always easy but is very important. Apparently these creatures, named Killer Whales by mistranslation, the term derived from ‘asesina de ballenas’ meaning whale killer named after the whale hunters, and the misappropriation of these Spanish words made way for this moniker, Killer Whale. In fact, there have been no cases of these Blackfish killing humans in the wild, in captivity however……. We find out that Orcas are closely related to dolphins and experts tell us that their brains contain the part that deals with emotions; they have feelings and intelligence and any experience they go through they are, like humans, massively affected by. A trapped animal will attack when given the chance and a traumatised one will kill. Enter Tillikum, whose story is tragically chronicled here in this film. This should be the nail in the coffin of Seaworld, what we are shown here is that the trainers love the animals and the top tier management in the company seem to care little for the safety of the whales and the trainers, being wholly interested in revenue. Aaah….big business. There are many moments in this film where your heart is literally in your mouth and director Gabriela Cowperthwaite puts the documentary together with skill and heart. If you haven’t seen it yet, watch it………and don’t take your kids to Seaworld.